4 worlds, 4 stories... Discover the ambiance we create! 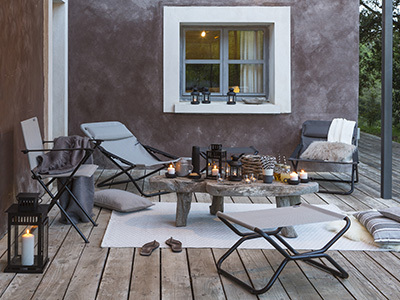 Keeping faith with the commitment made by the brand that has been manufacturing in France since its very beginnings, LAFUMA furniture will make your life easy: with practical folding, and compact, portable designs. Our products can be with you for all the special moments in your life, bringing optimum comfort to make these times perfect, both outdoors and inside. 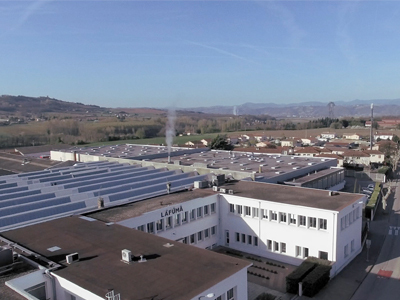 Well-being and practicality are the key words for Lafuma Furniture. Being close to nature while being inspired by it. Doing more with less, is the principle which we apply every day when designing our garden furniture. This year we have created the Natura collection, which evokes the sense of wild landscapes, inviting us to maintain a link with our origins. An authentic and sincere theme with plant and mineral-inspired colours. Water, plants and the earth are credited with our new colourways, all designed to give you moments of unique relaxation. Thus, a contemporary way of living is created with a close link between the urban and natural world. For a chic, understated outdoor look, discover the Lac, Moss and Terre colours. A blue that we never tire of, Lac appeals to a romantic outlook! A light colour which recalls the vast stretches of water, preserved by nature over many years. Considered to be one of the most harmonious and peaceful colours, blue makes us think of dreaming and well-being. Moss, which references the plant, moss, in English, is a green which conjures up greenery, plants and tree bark. This khaki hue combines serenity and elegance, bringing a peaceful and reassuring touch to your rooms. The Terre colourway echoes the strength of nature, earth and the landscapes shaped by man. A tone that is easy to combine with others, it will easily look at home. Evoking nature, it brings a feeling of well-being and restfulness. This trio of colours will make your outdoor spaces even closer to nature and can bring you moments of relaxation, calm and rest. A guaranteed zen moment! The Poesy collection highlights bright colours. 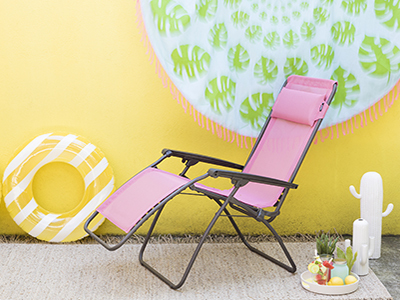 This new daring theme, with bright, acid colours is the perfect definition of an outdoor area which is full of life. Poesy, is all about escaping from established ideas, while enjoying radiant happiness and delight in the everyday. Have fun inventing a new living space imbued with ways to feel happy! So many colours come together to create this modern decor, starting with Bégonia. An energy-filled colour, this pink forms part of the tones which combine well with a huge number of other colours, bringing a very contemporary ambiance, with a fun character. For elegant decor, nothing beats this beautiful pink to make your space “pop”. The colour Menthol, a refreshing green, is ideal for creating a classic, timeless space. Dynamic and natural, this colour will bring a feeling of comfort and well-being in a theme that is both chic and inviting. And to finish on a lively note, there’s nothing better than our Citrus colourway. If there is a yellow to showcase on sunny days, it has to be lemon yellow. It brings a sparkling and light touch to create an energy-filled peppy ambiance. An uplifting tone, the colour, will bring light into your living spaces, both indoors and outside! You will find that this trio will brighten your rooms. So, don’t delay any longer - enhance the good mood with the fresh new versions of our garden furniture! The following collections will transport you to the turquoise waters of the Southern Seas or the sea-spray of the North Sea. Choose your destination and create an outdoor space that matches your personality. So, sit down and relax, close your eyes, as this year we are going to take you travelling! Main destination, the North Sea Landscapes sculpted by the wind, wild and authentic coastline, giant cliffs overlooking the horizon... The stuff of dreams. Norwegian fjords, the ports of Rotterdam or Hamburg, all of these amazing sites contribute to the beauty of these nordic landscapes. Dive into a world that takes your breath away... So you can keep dreaming of it we have chosen colours, some grey, some sepia, all the better for imagining the legendary North Sea. Be seduced by our new North Sea collection and its world of elegant and authentic colours. For those who dream of swimming freely in the immense blue ocean, of lazing on a magical island in the Cyclades, the following destination will be perfect... We are dropping anchor in the Mediterranean, to discover the new Southern Sea collection. Filled with light, it invites you on a voyage to a sun-kissed land. A crystal-clear turquoise blue, Aqua represents the coolness and clear waters of the Mediterranean. In decor, blue tones have the advantage of being incomparably light, and are never overwhelming in your living space. The intense azure blue of Outremer brings a certain calmness, and even though a deeper colour, it maintains a “bright” and vibrant side. For a beautiful finish, we have the colour Ecume, a grey burnished by sea-spray and bleached by salt. It will soften the ambiance and bring a touch of light to your space. Clarity, light and escape are the 3 key words for the Southern Seas collection. Our collections are designed to enhance both your exterior spaces and your interiors. Your living space will reflect a trendy, modern look. 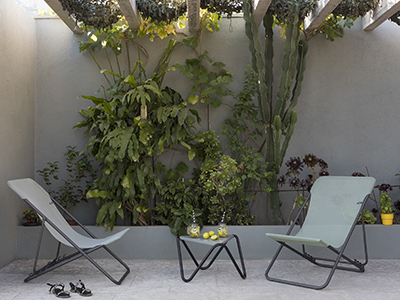 Relaxation chair, deckchair or sun lounger, our various ranges will enhance your poolside and you can extend these leisure moments with these new colours which also sit down to dinner with you! 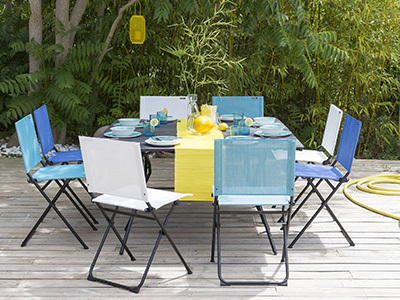 What could be better than a beautiful selection of colours around our folding outdoor table? You will fall in love with our various collections with assured designs. If you are more dynamic, and want to bring some pep to your space, choose the Poesy collection. If you prefer a classic, simple ambiance, the North Sea collection is perfect for you. You feel close to nature - you will no doubt love the collection Natura. And finally, if you dream of getting away, choose the Southern Seas collection. We also offer a range of Air Comfort products, which we will be unveiling soon. 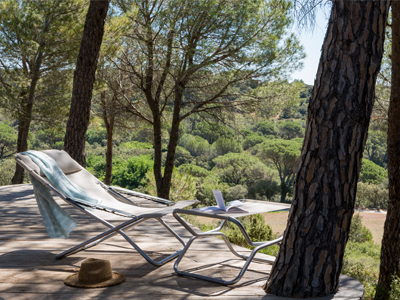 Live all the best moments by combining well-being, calmness and conviviality with our products. So don’t hesitate to imagine your decor with Lafuma FurnitureLafuma Mobilier.